I wound up doing a sort of sequel to my China’s Forgotten WWI post for the LA Review of Books China Blog, this one looking at—no surprise here—China’s forgotten WWII. The new post is a Q&A with Oxford historian Rana Mitter, author of Forgotten Ally: China’s World War II, 1937–1945. I’ve used this book a couple times now in teaching, and have assigned sections from it again this semester, and my students are always shocked to learn that China was an American ally during World War II. They usually say that their high-school history classes focused on the war in Europe, with a quick mention of the Japanese bombing of Pearl Harbor and that as a result, there was some fighting in the Pacific. But actually, the war in China was a really big deal (especially for the Chinese! 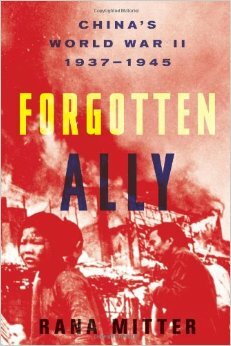 ), and Mitter brings out the full story exceptionally well in Forgotten Ally, moving between the big picture of the war’s events and the on-the-ground effect it had on the lives of millions of Chinese. Definitely a book worth reading if you’re interested in this topic.